All but three seeds advanced to the 3rd round of the Sony Ericsson Open, including the top four, who did not drop a set. Rafael Nadal and Andy Murray breezed through on Friday, whereas Roger Federer and Novak Djokovic had a little more difficulty on Saturday. Roger Federer had to be sharp in his opening round match against the young American Ryan Harrison. The two met in Indian Wells last year and the youngster took Roger to a tiebreak in the first set, so I knew his potential to cause a stir. Roger got out to a very quick start, seemingly continuing his momentum from Indian Wells last week. He won the first set 6-2 - almost too comfortably for my liking. In the second, he got an early break and served for the match at 5-3, but the fiery Harrison broke back and he suddenly had life. How Roger got broken was a little controversial for me, however: midway through the rally, Fed hit a ball on the line and a person in the crowd called the ball out - not to Fed's knowledge. Roger didn't play the next shot, assuming the ball was called out by a lines judge, and Harrison got the break. Now, I am not completely briefed on the rulebook of tennis, but to me, the point should have been replayed on some kind of hindrance. Nevertheless, Fed got through a tiny rough patch in play and stormed through the tiebreak 7-3, ending the match in fine fashion. 62 76(3) Fed in an hour and fifteen minutes. After the match, Fed showed great class and sportsmanship by embracing Harrison at the net and wishing him the best the rest of the year. It was truly a special moment. Knowing how dangerous Harrison can be, I am happy with the way Fed played. I didn't expect him to play a great opening set, but he did, and in the second he played his best in the tiebreak to put the match to bed. Roger did point out his relief to come through, under the circumstances. He said, "I felt like I had to win the match like three times at the end, so I was relieved to come through. Beating against an American in America is always a big deal, because this is where they usually play their very best." Warm embrace - both have great respect for each other. Novak Djokovic overcame a stern test against former top 10 player Marcos Baghdatis 64 64. It was a tight match but a good win for Novak, considering he had lost a set in his previous five matches against the Cypriot. The Serb did seem overly intense after winning the match, but I account that to his knowledge of how important winning this Miami title is, and coming through in a tough early round match. The day before, Andy Murray did not stumble out of the gate this time around, and he dispatched Alejandro Falla 62 63 and Rafa Nadal destroyed Santiago Giraldo 62 60. Rafa was obviously letting out all of his frustration after the windy, nonrhythmic loss to Federer in Indian Wells. The only three seeds to fall in the 2nd round were Feliciano Lopez (15), Marcel Granollers (24), and Juan Ignacio Chela (29). John Isner survived a scare against Davydenko, winning in three, and Janko Tipsarevic avenged his loss to David Nalbandian last week with a convincing straight sets win. David Ferrer beat youngster Bernard Tomic in straights. Last week, he had to play Grigor Dimitrov, another highly skilled, highly touted up-and-comer. David has to hope he doesn't get any more young guns in the near future in his early part of the draws. The 3rd round looks to have some very good matches on hand, and even some with upset potential. There is not one match there that does not have the potential to be great. That is a SUPERB 3rd round lineup if you ask me. Federer/Roddick, Murray/Raonic, Jo/Kohl, Fish/Anderson, Tipsy/Dolgo, Delpo/Cilic, Almagro/Verdasco, Simon/Melzer, and Monfils/Monaco should all be highly entertaining. Don't expect Nadal or Djokovic to get pushed. Troicki has given Nole much trouble in the past but can never actually follow through and beat him. Almagro and Verdasco played in Acapulco, where the latter won, so Nicolas will be looking to right the wrong and get some payback. -- Federer and Roddick will play for the 24th time. Fed, of course, leads the head-to-head 21-2, but most of their matches are close, even if the same person wins the vast majority of them. Roger has so much respect for Andy's serve that he never takes him lightly, and therefore usually always plays his very best against his oldest rival. Andy has beaten Roger in Miami, in 2008, and it should be a very close match. -- Murray vs Raonic should be very interesting. Milos has the game to beat Andy and he could very well do that. We saw how he pushed Roger in Indian Wells and the same could happen here. -- Kevin Anderson vs Mardy Fish has upset written all over it for me, especially with the way Fish has played this year. Don't be shocked to see the American lose. -- Monfils vs Monaco is a match to watch for if you are a Fed fan because one of them will face the Swiss Maestro in the 4th round should Fed get by Roddick. 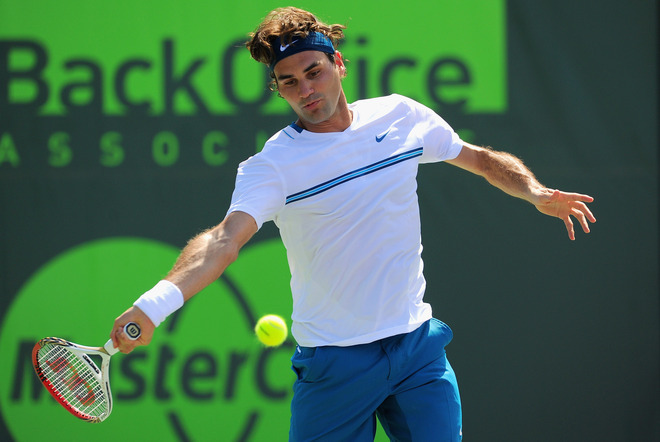 It's already shaping up to be a wonderful 2012 Sony Ericsson Open!